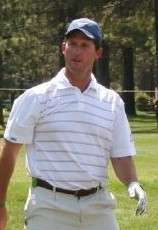 The number of games started during the season is listed to the right of the player's name. The following quarterbacks have the most starts for the Panthers in regular season games. Bold text indicates the player is currently on the team's roster. ↑ "2014 Carolina Panthers Statistics & Players". Pro Football Reference. Sports Reference LLC. Retrieved 2015-01-01. ↑ "2012 Carolina Panthers Statistics & Players". Pro Football Reference. Sports Reference LLC. Retrieved 2012-10-02. 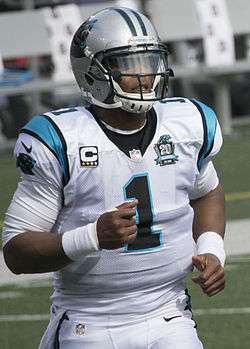 ↑ "2011 Carolina Panthers Statistics & Players". Pro Football Reference. Sports Reference LLC. Retrieved 2011-09-11. ↑ "2010 Carolina Panthers Statistics & Players". Pro Football Reference. Sports Reference LLC. Retrieved 2010-11-28. ↑ "2009 Carolina Panthers Statistics & Players". Pro Football Reference. Sports Reference LLC. Retrieved 2010-11-28. ↑ "2008 Carolina Panthers Statistics & Players". Pro Football Reference. Sports Reference LLC. Retrieved 2010-11-28. ↑ "2007 Carolina Panthers Statistics & Players". Pro Football Reference. Sports Reference LLC. Retrieved 2010-11-28. ↑ "2006 Carolina Panthers Statistics & Players". Pro Football Reference. Sports Reference LLC. Retrieved 2010-11-28. ↑ "2005 Carolina Panthers Statistics & Players". Pro Football Reference. Sports Reference LLC. Retrieved 2010-11-28. ↑ "2004 Carolina Panthers Statistics & Players". Pro Football Reference. Sports Reference LLC. Retrieved 2010-11-28. 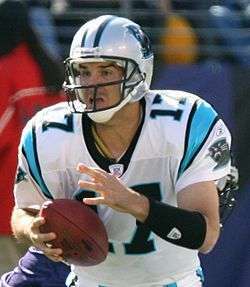 ↑ "2003 Carolina Panthers Statistics & Players". Pro Football Reference. Sports Reference LLC. Retrieved 2010-11-28. ↑ "2002 Carolina Panthers Statistics & Players". Pro Football Reference. Sports Reference LLC. Retrieved 2010-11-28. ↑ "2001 Carolina Panthers Statistics & Players". Pro Football Reference. Sports Reference LLC. Retrieved 2010-11-28. ↑ "2000 Carolina Panthers Statistics & Players". Pro Football Reference. Sports Reference LLC. Retrieved 2010-11-28. 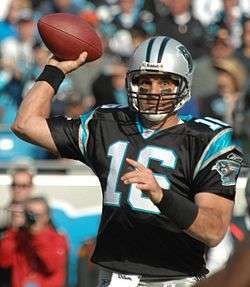 ↑ "1999 Carolina Panthers Statistics & Players". Pro Football Reference. Sports Reference LLC. Retrieved 2010-11-28. ↑ "1998 Carolina Panthers Statistics & Players". Pro Football Reference. Sports Reference LLC. Retrieved 2010-11-28. ↑ "1997 Carolina Panthers Statistics & Players". Pro Football Reference. Sports Reference LLC. Retrieved 2010-11-28. ↑ "1996 Carolina Panthers Statistics & Players". Pro Football Reference. Sports Reference LLC. Retrieved 2010-11-28. ↑ "1995 Carolina Panthers Statistics & Players". Pro Football Reference. Sports Reference LLC. Retrieved 2010-11-28.